As wood products become increasingly specified in a wide range of construction projects, understanding the fire properties required by the National Construction Code (NCC) and how wood products can comply is essential. Currently, the NCC does not permit the use of fire retardant coatings to achieve the required fire hazard properties under the Deemed-to-Satisfy (DTS) provisions. The WoodSolutions Design Guide has been written to provide a Code of Practice to enable the use of fire retardant coatings applied to wood products, via the Performance Solution pathway, as a means of achieving the fire hazard properties required by the NCC. 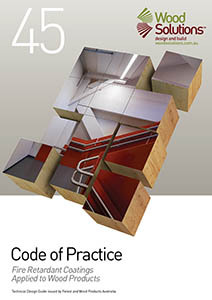 This Code of Practice is intended to supplement the NCC by addressing issues relating to the supply, testing, installation and maintenance of fire retardant coatings.